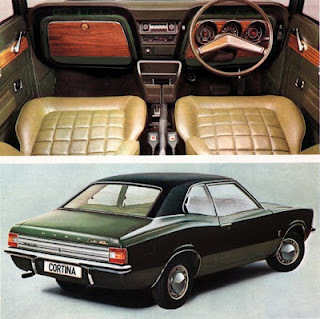 The 1971 Ford Cortina GT carried a special Canada-only blackout grille, styled steel wheels and special bucket seats with headrests moulded into the seat backs. Ford dealers throughout the Dominion began selling the British Ford Model Y in 1933. Sales were modest--only eight were delivered that year-- but they continued to grow. The cars were small, sturdy and thrifty; just what the doctor ordered. 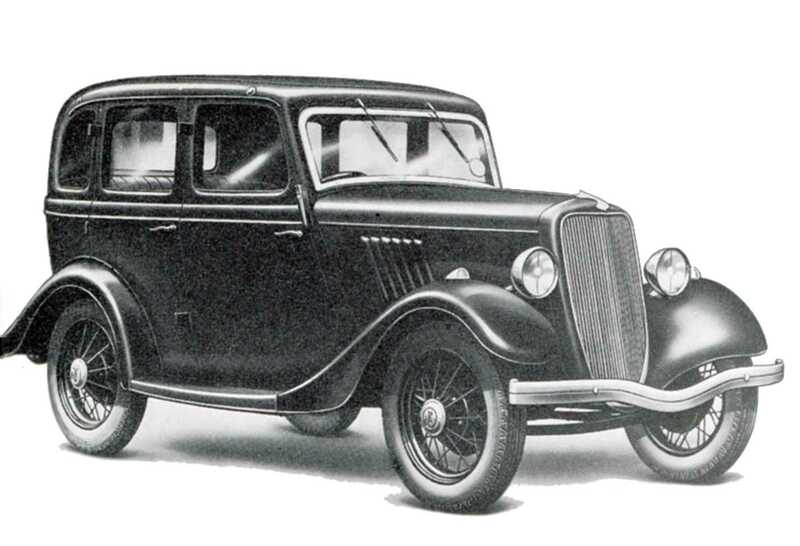 The 1933 Ford Model Y. During World War Two production was suspended as workers churned out war materiel but with victory in 1945 came a return to civilian manufacturing and the Ford factories at Dagenham, England began to hum to the happy sound of automobile assembly. Canadian owners were delighted to have their little British Fords again. They could have their cake and eat it, too. Owners could be brand loyal, drive a new car, save big bucks and take advantage of the vast resources behind the global Ford organization. The deal was good for Ford, too. Canada was a self-governing dominion within the British Empire and enjoyed the special tax status afforded to member nations and colonies. The empire gave way to the new British Commonwealth in 1948 and automobiles were an important part of inter-commonwealth trade. After the war, Ford execs reorganized the dealer body. Ford-Monarch dealerships and Lincoln-Mercury-Meteor dealerships created a much larger corporate presence across the nation. British Fords were sold by both. 1950 Ford Anglia and Prefect advertising for the US market. Note the word 'English' is used. In Canada, the cars were billed as 'British' built. 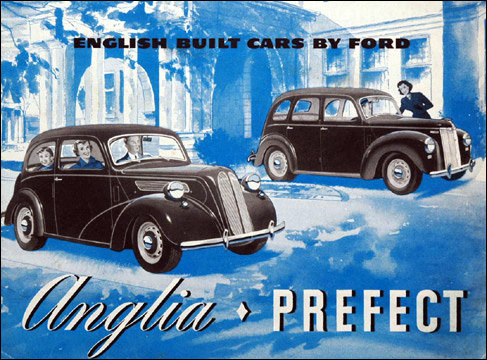 It is interesting to note that advertising was careful to refer to them as British Fords or British-built. Our American neighbours bought English Fords but that would never have worked here. The English, Scottish, Welsh and Irish have highly distinctive cultural heritages and would have taken umbrage at insensitive publicity that referred to an 'English' Ford. The Ford Cortina bowed in 1963. It was immediately popular. Britian's Number One seller quickly became Canada's Number One import. Folks from St. John's to Victoria practically lined up to buy the little darlings from Dagenham. In 1970 British Fords were withdrawn from the US market but the love affair with them continued in the land of the maple leaf as 10,936 units were sold. Sales of British Fords fell to 6,889 units in calendar year 1971. All were 1970 models. The tally would have been much better but for a bitter strike in England. 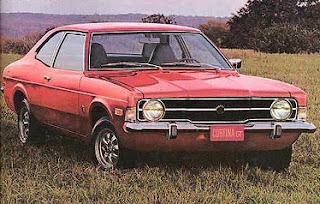 Not a single 1971 Ford Cortina was sold in Canada. 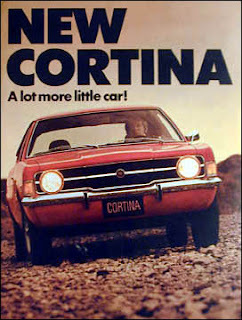 Executives in Oakville finally were able to send out a press release: "The all-new 1972 Cortina will be introduced at selected Ford and Mercury dealerships on the west and east coast August 6 and in the rest of Canada August 20. Model availability includes the L-series two-door, four-door, station wagon and GT two-door. All have new design more interior space, improved ride and handling power disc brakes and 2000-cc engine with four speed manual transmission as standard equipment." The Cortina borrowed styling cues from its Mustang cousin. Early advertising in domestic magazines showcased the car the the "L" and "XL" trim packages, though no "XL" models ever arrived in Canada. Folks who took home the racy GT bought a car with a unique-to-Canada grille that stood out like a pair of red mitts in a snow bank. 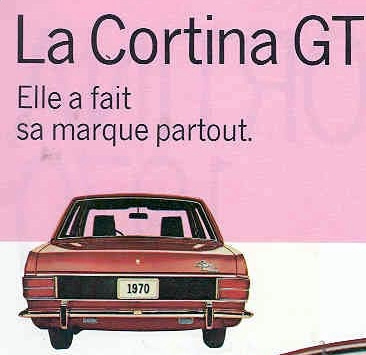 They were easily distinguished from the crowd of British, South African, Australian and other export Cortina GTs. Changes were thoughtful. The wheelbase grew from 2 489 millimetres (98 inches) to 2 578 millimetres (101.5 inches), though the overall length stood pat at 4 442 millimetres (174.9 inches). The Cortina was widened. Its front track was stretched 3.5 inches to measure 56 inches. Oddly enough, the old 1600-cc Kent engine was available as option in Canadian Cortinas for a few months in late 1971. 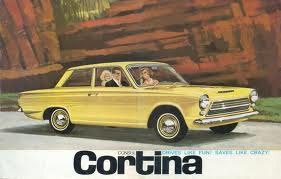 Cortinas built for the UK market also got the 1600-cc engine. 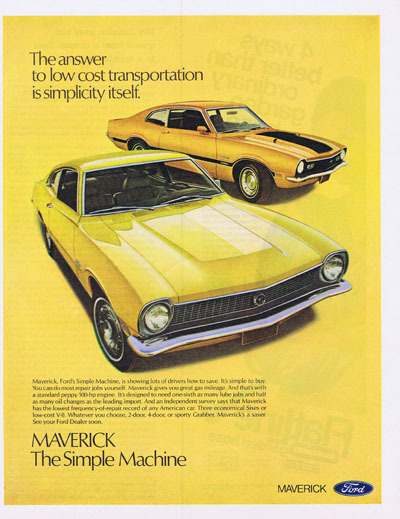 The 1971 Maverick was Ford of Canada's domestically-built compact entry. The Cortina now competed with compact Ford Mavericks and Mercury Comets sourced from Ford's plant in St. Thomas, Ontario. The even smaller and adorable pint-sized Pinto bowed at Ford dealerships. The sophisticated Cortina did not suffer in the least from the in-house competation. 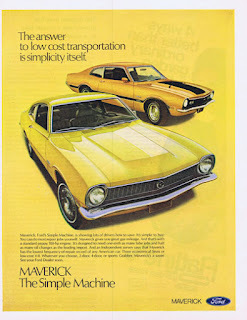 Sales hit 12,135 units for the 1972 calendar year. When the tastefully facelifted 1974 Cortina made its world debut in the fall of 1973 it was absent from Canada. The company's annual report told stockholders that Cortina could no longer meet the stringent requirements adopted by the Ministry of Transport. It further pointed out that the wild currency fluctations of the pound sterling made the importation of the Cortina impractical. The 1974 Mercury Bobcat was strictly for the Canadian market. 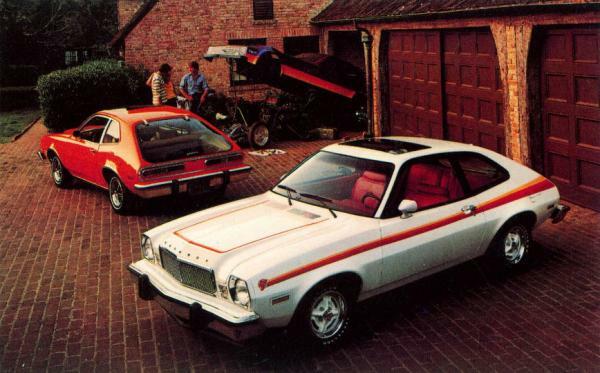 Americans would get the pint-sized Merc in 1975. Those Lincoln-Mercury-Meteor dealers who had sold and serviced the Cortina were given the Canada-only badge-engineered Merclury Bobcat on November 30, 1973. Sales of the "little critter who was Mercury's new "pick of the litter" were brisk but came nowhere close to the deleted Ford Cortina. The Ford Cortina was an undeniable success, with over ten years of being the best selling new car in the UK. It is certainly safe to say that Ford achieved their goal.